También conocido como el King o Royal Tiger. Producido desde enero de 1944 hasta marzo de 1945, con un total de 489 vehículos construidos. One of the most feared tanks in the Second World War, it operates average in stock configuration. With proper positioning it is capable of bouncing shells off its sturdy sloped front armor, provided that you hide your lower front plate at all times as it is only 100mm thick, and sports a workable level of mobility. The Tiger II or the "Bengal Tiger" (in German "Königstiger"), more commonly known to the Allies as the "King Tiger," is an excellent sniper, with superior accuracy and great rate of fire. Stock turret has very low armor values and your enemies will focus on that as a weak spot. The Tiger II more or less plays like the tier 7 Tiger, but with greatly improved armor. It can hold its ground, should it be challenged in a close-ranged engagement; however as with the Tiger it is recommended that you try to keep enemies at range since your sides and lower front plate are too vulnerable in a brawl. PzKpfw VIB Tiger II is one of the tanks that are a challenge for many higher tiers. Tier IX tanks treat this tank as a danger, while quite a few tier X tanks treat it seriously. That does not mean that this tank can be played as a brawler in high tier matches. Make use of the well-engineered armor and the superior accuracy of its gun, high penetration and (uncommon for Germans) good gun depression, use cover and fight at range. If played well, this tank can fight any tank of the same tier and win. You are going to have a huge impact on the outcome of the battle. Don't be surprised if many of your team tanks follow you wherever you go. Plan to spearhead the main attack. If you're forced into a defensive role, go where your line is weakest. Then the vast majority of enemy tanks will be tiers 9 and 10. You'll need to target vulnerable areas of the enemy tanks. Otherwise, you won't stand a chance. Try to stay alive and you might make more of a difference once the strongest tanks kill each other off. Upgrading the turret is a good place to start, due to the increased front armor and DPM. You can mount it with the stock suspension, but you'll have to either forgo the top engine and equipment or temporarily use the enhanced suspension equipment. Otherwise you'll need to research the suspension first, leaving you with a vulnerable turret for quite a while. Mounting the short 10,5 cm KwK 45 L/52 is ill-advised, because its penetration and accuracy are lower than 8,8 cm's as well as DPM, and the quadrupled shell cost will prove to be an expensive decision. If credits aren't a problem, then you could mount the short 105 for the the higher damage per round. The Tiger I had hardly entered service before the German General Staff requested a bigger and better successor, superior in armor protection and firepower to anything the Soviets were likely to produce. Henschel tried to persuade the General Staff to accept an interim solution in the autumn of 1942, which consisted of installing a curved bow-plate on the Tiger I, but this solution was rejected. The German point of view was that, at the rate of evolution in armored warfare, superiority could only be maintained by one year, at maximum. Things being as they were in early 1943, the Tiger I and the Panther would be enough, but in order to preserve the superiority in 1944, a new heavy tank would be necessary. 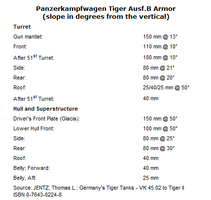 On January 1943, Hitler decided that the new Tiger would have the longer Rheinmetall 88 mm Flak 41, and to have 150 mm of front armor and 80 mm of side armor: the angle of the armor plates resulting in the new tank looking very similar to the PzKpfw. V Panther. Once again, Porsche and Henschel were asked for designs which were to incorporate the latest sloped armor and the installation of the longer Rheinmetall 88 mm Flak 41. However, there was the sensitive question, for Krupp, of mounting an archrival's gun in their turret. On 5th February 1943, Krupp was awarded the contract for the development of the 88 mm KwK 43 L/71, a new gun specifically designed for the successor of the Tiger I. The only similarity between this gun designed by Krupp and the Rheinmetall Flak 41 was that the same penetration values were achieved when the same shell was fired with the same initial muzzle velocity. All other characteristics of the two guns were different. Following the main specification to achieve equivalent armor penetration, Krupp completely redesigned the gun for mounting in a tank turret. As compared to the Flak 41 L/74, the KwK 43 L/71 was shorter with different rifling and had a muzzle brake to retard recoil. In addition it had shorter, fatter recoil cylinders to fit inside a turret, had an air blast system fitted to evacuate fumes from the gun directly after firing, and chambered a shorter (but thicker) cartridge case for easier loading inside a turret. 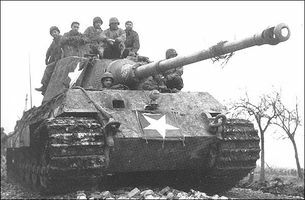 Some Tiger IIs were used during the Battle of the Bulge, 6 months after D-Day. Porsche updated its Tiger I design, and this time, was so sure of winning the contract that it ordered a first batch of 50 turrets from Krupp. Unfortunately, the Porsche ideas of electric transmission were once again rejected, as the supplies of copper were too small, and the contract went once again to Henschel. However, since 50 early-style turrets had already been made, they were fitted to the first units produced. The curved front plate created a serious shot trap, which deflected incoming rounds down into the driver's compartment. The bulge for the cupola was also a weak area in the turret side-armor. Krupp then modified the turret, and the new design eliminated those deficiencies, was simpler, and offered better protection while providing room for 6 more rounds of ammunition. The new Serien-Turm (series production turret) designed for the Tiger II had a 180 mm thick front plate, 80 mm sidewalls, and 40 mm roof. The gun mantlet was specifically designed to be immune to attack or being jammed. This new design did not create high explosive blast pockets and prevented deflections of projectiles down to the deck. The early-style turret is commonly referred to as the 'Porsche Turret'; and the series production turret, as the 'Henschel turret'. However, both turrets were designed and built by Krupp, and this classification leads to misunderstandings. It is best to call the first 50 turrets "early-production turrets", and from the 51st on as "series production turrets" (Serien-Turm). In February 1943, WaPrüf 6/III drew a requirement for an extensive unification of the specification in order to standardize as many parts as possible with the Panther II, which never went into production, and the subsequent delays caused the production to never reach the planned levels until December 1943. The PzKpfw. Tiger Ausf. B was a massive and formidable vehicle, designed to dominate the battlefield. The new hull design for the VK 45.03 (H) consisted of sloping plates for increased protection. The front glacis plate was 150 mm at 50°, front nose plate 100 mm at 50°, superstructure side plates 80 mm at 0° vertical, tail plate 80 mm at 30°, deck plates 40 mm at 90° horizontal, and rear belly plate 25 mm horizontal. Forty-eight rounds of ammunition for the main gun were stored horizontally in panniers on each side of the hull. The rounds were stowed in three groups, on both sides. Each group was separated by sliding metal panels. An additional ten to 16 rounds were stacked loose on the turret floor. The whole running gear was redesigned. For the first time, a staggered running gear with nine pairs of rubber-spring road wheels, of 800 mm diameter, was used on each side. These road wheels consisted of two strong sheet-steel rims attached to a wheel disk of steel between two rubber rings under very high pressure. The drive sprocket was similar to that of the Tiger I, but were built more strongly. The road-wheel cranks were single drop-forged pieces and much strenghtened. The crank arrangement resembled those of the Panther without rubber, but with layered conical springs. Compared to the Tiger I, the torsion bars were strenghtened and fitted with toothed heads. They no longer differed in diameter, so they could not be fine tuned. The combat tracks, which weighed 3.2 tons each, were 800 mm wide, thus providing an acceptable ground pressure (when the tracks sunk to 20 cm) of 0.76 kilograms per square centimeter. Once again, loading tracks, 600 mm wide, had to be used for rail transportation. The combat weight of the vehicle was 68.5 metric tons. The Panzerkampfwagen Tiger Ausf. B powerplant was the Maybach HL 230 P 30, a 12-cylinder engine also used on the Panther, producing 700 HP at 3,000 rpm, then through an 8-speed Maybach transmission and was designed to provide a maximum speed of 41.5 km/h. The OLVAR gearbox required a shifting process that was just like that of a manual transmission with power interruption. Its trouble free operation depended largely on the ability and calm (even in combat) of the driver. However, the easily shifted OLVAR gearbox and easily steered two-radius steering gear definitely improved the driver's job. The official designations were Panzerkampfwagen Tiger Ausf. B and Panzerbefehlswagen Tiger Ausf. B (for the command version), which originated in a WaPrüf 6 (Waffenprüfamter 6 - Weapons Development and Testing Department - "6" being the number that corresponded to "Tanks and other Vehicles") order dated 2 June 1943. The official designation was frequently shortened to Tiger B. 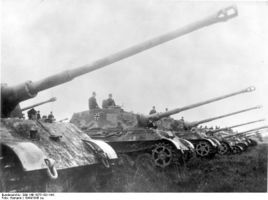 The full titles Panzerkampfwagen Tiger (8,8 cm Kw.K. L/71) (Sd.Kfz. 182) and and Panzerbefehlswagen Tiger (Sd.Kfz. 267 und 268) Ausf. B were specified by the Inspecteur der Panzertruppen (In6) for use in training and maintenance manuals, as well as in the K.St.N. (organization and equipment tables). 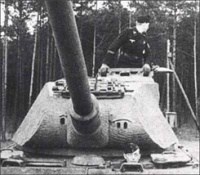 The suggestive name Königstiger (King Tiger) was an unofficial designation first used by the Reichsministerium für Bewaffnung und Munition, in 11 December 1944. This was never an officially accepted designation during the war by either the Panzertruppen or the Waffenamt. The long and powerful 88 mm KwK 43 L/71 gun could outrange and outshoot the main armament of nearly all Allied tanks, and this allowed the Tiger II to stand off and engage targets as it choose. Besides that, the 88 mm KwK 43 L/71 was a very accurate gun, being capable of first-round hits at well over 1000 meters. Given its high muzzle velocity, barrel wear was a difficulty with this gun, but this was solved by building the barrel in two sections, so it was possible to change the faster-wearing part easily. The tables below represent the penetration capability of penetrating armor at an angle of 30 degrees from the vertical, and the probability of hitting a target representing the front of a tank. During World War II, the Armor Piercing (AP) round relied on its own weight to penetrate the enemy's armor. The higher the muzzle velocity, the more penetration any kind of AP round would have, all other variables remaining constant. The Armor Piercing Capped, Ballistic Capped (APCBC) round relied not only on its own weight to penetrate the enemy's armor, but was also filled with high-explosive that caused great internal damage. The Armor Piercing Composite Rigid (APCR) round was made with a tungsten core. For flight performance effects and to aid the shot from shattering against armor plating, the APCR round was surrounded by a ballistic cap. The HEAT round, which was based on the hollow charge principle, used a directed explosion, rather than mass or weight, to penetrate armor. The explosion is channeled forward into a stream, which cuts through armor, melting it along the way and including it in the stream. The designation 88 mm KwK 43 L/71 means that the diameter of the bore (caliber) of this gun is 88 mm, this is a Tank Gun (Kampfwagenkanone), that the year the development of this gun was finalized was 1943, and that the length of the gun equals 71 times the diameter of the bore (caliber) of the same gun. This was the main gun installed on the Tiger II. Of the total ammunition load of 86 rounds (80 for the Tiger II with "early-style" turrets), the recommended ratio was 50% Pzgr.39/43 (APCBC) and 50% Sprgr. (high-explosive shells). The Gr 39/3 HL (HEAT) were rarely used. When available, but very rarely due to a severe shortage, a few Pzgr.40/43 (APCR) rounds were carried for use against the heaviest armored Russian tanks and tank destroyers. The sights for most of the Tigers II that actually saw combat was the articulated, monocular Turmzielfernrohr 9d mounted parallel and on the same axis as the main gun. The gunner could select two magnifications, 2.5x and 5x. The lower magnification provided a wider field of view for target identification. The higher magnification assisted in precise aiming at long ranges. Two adjustable range scales allowed the gunner to register the exact range to the target. The range scale for the Pzgr.39/43 was graduated at 100 m intervals out to a range of 4000 m and the second range scale for the Sprgr.43 was graduated out to a range of 6000 m.
Numerous statements have been made that the Tiger II was too heavy, too big, too slow, "a casemate", etc. One is left with the impression that it was lucky to move at all. These banal generalities, stated as incontrovertible facts, are never substantiated by actual specifications, test reports, or after-action accounts from the units that used the Tiger II. 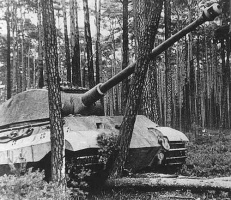 In spite of these frequently repeated remarks, the capability of the Tiger II to negotiate obstacles and cross terrain was equivalent to, or better than, most German and allied tanks. 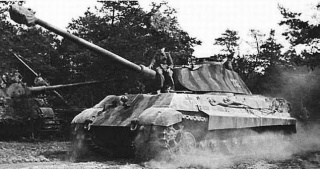 The Tiger II initially experienced numerous automotive problems which required a continuous series of minor modifications to correct. These problems can be traced to two main causes; leaking seals and gaskets and an over-taxed drive train originally designed for a 40 metric ton vehicle. The problem of keeping a Tiger II in running condition was compounded by a shortage of skilled drivers, many of whom may have never experienced driving any vehicle prior to entering the service. In addition, they were provided only limited driver's training, and then usually on a different type of panzer, and received their own Tiger II usually within a few days before being shipped to the front. But, with mature drivers, taking required maintenance halts, and modification of key automotive components, the Tiger II could be maintained in a satisfactory operational condition. Status reports from the Western Front, dated March 1945, showed that the percentage of Tigers operational at the Front was about equal to the PzKpfw IV and as good as or better than the Panther. Following an initial order for three prototype chassis, an initial production series of 176 Tiger IIs was ordered in October 1942. Following cancellation of the Porsche Tigers in November 1942, the contract (with Henschel) was quickly expanded by an additional 350. Later extensions to the contracts increased the total order to over 1500. 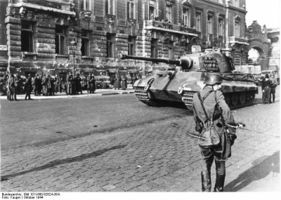 In accordance with the original production plans from October 1942, the first Tiger II was to be completed in September 1943. The number produced each month was to be expanded to reach a target of 50 per month in May 1944. This production schedule satisfied the Inpekteur der Panzertruppen, who wanted 100 Tiger II available for a spring offensive in 1944. Due to delays, the first prototype V1 was accepted by Waffenamt inspector in November 1943. Two further prototypes, V2 and V3, and the first three production series Tiger IIs were accepted in January 1944. The production run continued through March 1945 for a total of three prototypes and 489 production-series Tiger IIs produced by Henschel. Only one model was built, and despite the heavy Allied bombing, Henschel always had at least 60 vehicles being assembled on its tank assembly line floors at any time. At the peak, it was taking only 14 days to complete a Tiger II. Severe fuel shortages and heavy Allied bombing forced the factory to use bottled gas for testing, as all available fuel was supplied for operations. The war in North Africa and in the large plains of Russia had shown that range measurement in wide areas such as the desert or the Russian steppes would be most useful, as guessing the range could be misleading. When the tank halts before firing and the range to the target is under 1000 meters, the elevation of a high velocity gun such as the 88mm KwK 43 L/71 (whose muzzle velocity was equal or more than 1,000 m/s) is not affected much by range, and range measurements can be dispensed with. The great advantage of using a range finder lies in the possibility of opening fire at longer ranges. Without the range finder, precious time and ammunition were lost when the elevation of the gun must be corrected by observing the effect of fire. As the tank commander was preoccupied with other tasks, the gunner would take charge of the range finder. After locating the target with the periscope and aligning the target in the sight, the gunner operates the range finder, reads the range, and adjusts the range scale to the correct range, which provides the additional elevation associated with the range. The range scale was seen at the bottom of the field of the right eyepiece. It was graduated in meters from 550 to 20,000. On 28 February 1945, the armor manufacturers were asked, when turrets were produced, to mount the Entfernungsmesser (range finders). It was stated that they should strive to complete their first turret by 31 March and Krupp planned to start by mid-July 1945. Therefore, the effort was initiated too late to complete any Tiger IIs with range finders before the factory in Kassel fell into the hands of Allied troops. Chamberlain, P., H.L. Doyle and T.L. Jentz, 1999, Encyclopedia of German Tanks of World War Two - The Complete Illustrated Dictionary of German Battle Tanks, Armoured Cars, Self-Propelled Guns and Semi-Tracked Vehicle, Cassel Reprint, London, 272p, ISBN:9781854095183. Doyle, H. and T. Jentz, 1993, Kingtiger Heavy Tank 1942–45, New Vanguard Series 1, Osprey Publishing, Oxford, 48p, ISBN:9781855322820. Doyle, H.L. and T.L. Jentz, 1997, Germany's Tiger Tanks: VK45.02 to TIGER II Design, Production & Modifications, Schiffer, Atglen, PA, ISBN:9780764302244. Higgins, D.R., 2011, King Tiger vs IS-2 - Operation Solstice 1945, Duel Series 37, Osprey Publishing, Oxford, 80p, ISBN:9781849084048. Jentz, T.L. and H.L. Doyle, 2001, Panzer Tracts - No.6 Schwere-Panzerkampfwagen D.W. to E-100 including the Tigers, Jentz, Boyds, MD, ISBN:9780970840714. Spielberger, W.J. and H.L. Doyle, 2007, Tigers I and II and Their Variants, Schiffer, Atglen, PA, 256p, ISBN:9780764327803. PanzerWorld.com History and specifications of German tanks. AchtungPanzer.com History and details of Panzer and Panzertruppe.